Founded in 1936, the land that is now Fredrick Douglass park was for 81 years the victim of an egregious typo. Since the land was first designated as a park in 1936, there has been confusion surrounding its name. 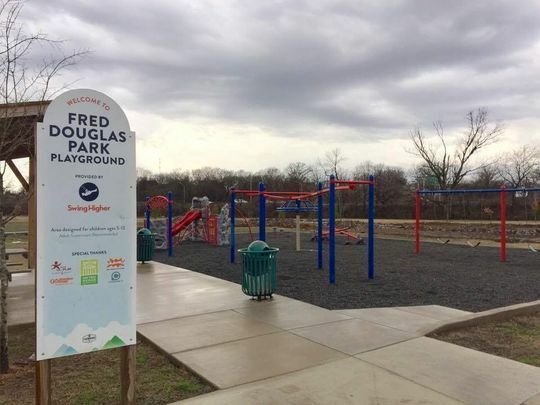 While a Tennessean articles of the period refer to the park as “Fredrick Douglass Park for Negroes,” the park was originally christened ‘Fred Douglas Park,’ and remained that way for over 80 years. In the early 20th century, Nashville seems to have had a track record of misspelling Fredrick Douglass’ name. A February 1917 edition of the now-defunct Nashville Globe details the local celebrations surrounding Douglass’ birthday—all while both referring to him as ‘Fred Douglass’, with the headline referring to him only as ‘Douglas’. What’s more, Fred Douglas park was only the city’s second designated public space for its African-American population. The first, Hadley park, was named after John L. Hadley, a former slave owner. At the time, naming the park in Douglass’ honor had the potential to create controversy around the park’s opening, at a time when such controversy could easily spark deadly results. The park was opened with no fanfare in March of 1936, under the name ‘Fred Douglas Park’. For most of the history of the park, the local municipal parks department has countered suggestions that the park was meant to be named after noted abolitionist and writer Fredrick Douglass with the assertion that it was named after a Fred Douglas that either owned the property before it was converted into a municipal park or played some role in the founding of Nashville. However, no record of such a person has ever been discovered. In 2017, despite language in the Parks and Recreation Policy manual that “no park once named may ever be changed,” the Nashville parks department voted unanimously to change the park’s name to Fredrick Douglass park. Olivia Pugh, “Fredrick Douglass Park,” Bygone Nashville, accessed April 25, 2019, https://bygone-nashville.mtsu.edu/items/show/43. Published on Nov 29, 2018. Last updated on Dec 6, 2018.